This is a story that I have been wanting to share with you for quite a long time. 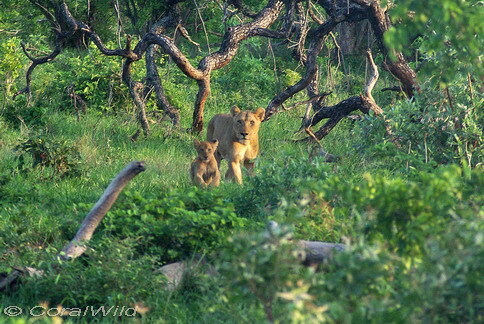 A couple of years ago I went on a Birding course in the far north of Kruger, and on the way there I had an incredible experience with lion and buffalo. This was near Punda Maria, where I camped for one night on the way north. 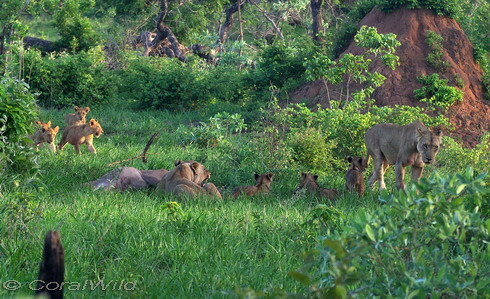 After pitching my tent in a shady spot, I went on a slow leisurely game drive. 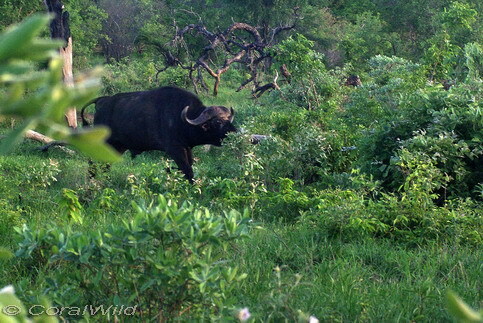 Though it was already late afternoon, the heat was stifling and the animals were mostly out of sight hiding deep in the lush green bush. 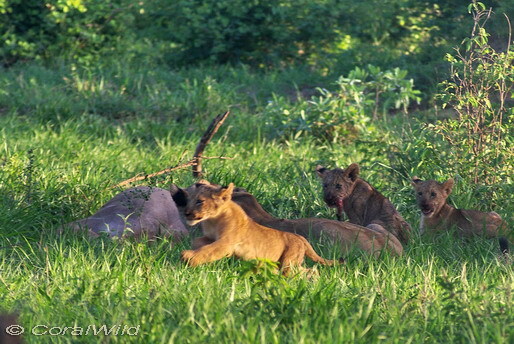 There was a beautiful lioness with three cubs, feasting on what looked like the remains of a Kudu antelope. 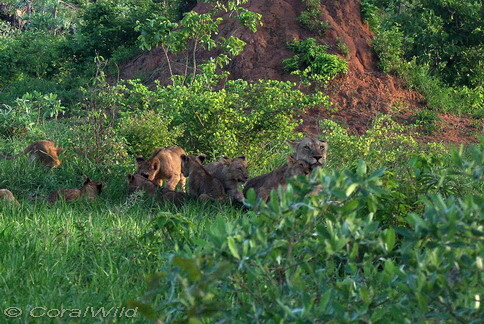 This peaceful scene lasted for a few minutes after I got there, until the lioness suddenly sat up, alert and focused. She then crouched down behind the carcase to keep out of sight. One of the cubs decided it was definitely not going to hang around and skittered off behind a bush. Three old buffalo were walking up the valley past the lions. One of them had obviously seen the movement, or had scented them, and paused to glare. 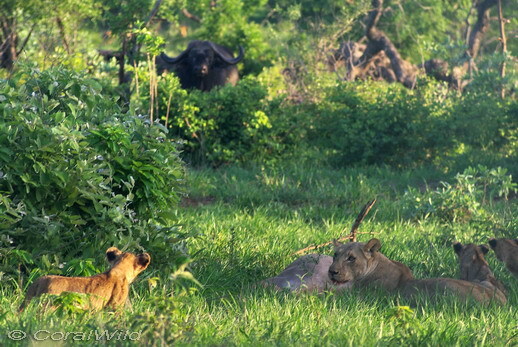 The buffalo resumed their slow, deliberate trudge and the lions relaxed a little. 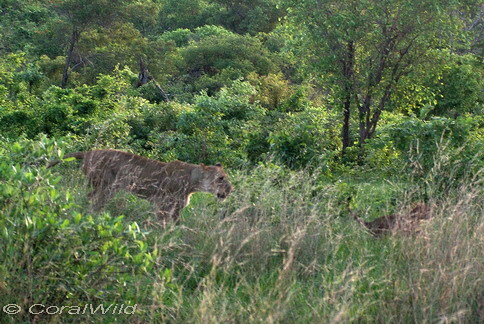 A glimmer of gold in the distance, and another lioness with cub came into view. 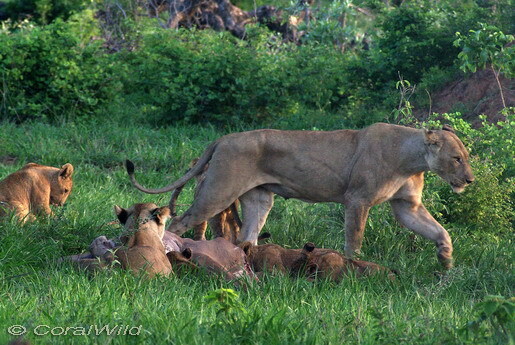 And then a third lioness with more cubs strolled into the scene. 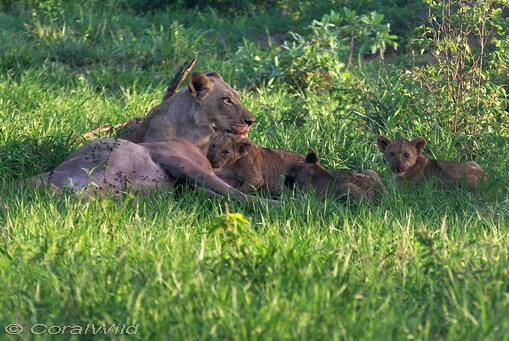 Within a few minutes we had 3 lionesses and 9 cubs relaxing, playing or idly gnawing on kudu. In an instant, this peaceful scene changed. A lioness leaped to her feet and stared up the valley. She whipped around and moved swiftly into the bushes on the right. Well, to find out go to Part 2 of this story. What a fantastic sight! I've seen mothers in the wild with their cubs and kill but never 3 at once with their cubs. 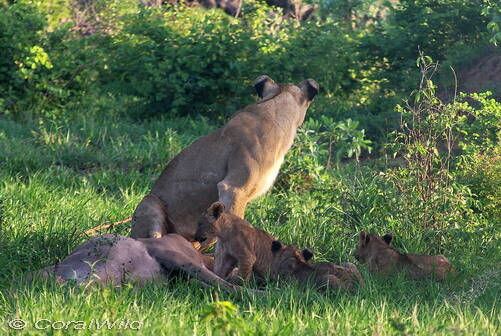 Your story really illustrates how mothers in the wild must always be alert to danger. Can't wait for your 2nd installment. 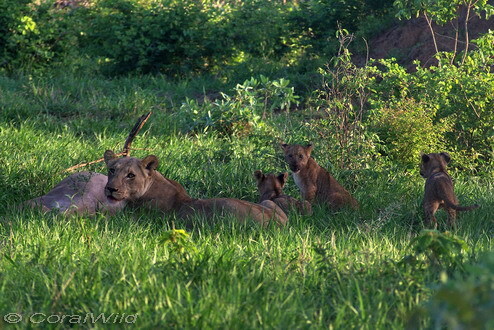 It was fantastic:) I had never seen 3 mothers with their cubs this close before either! Aarrgh! No fair! The suspense is killing! Hi Coral .. what an amazing experience - how fascinating to have been there .. and loved the pictures - they are just wonderful. Thanks for the comments Hilary - may you have a good weekend too! 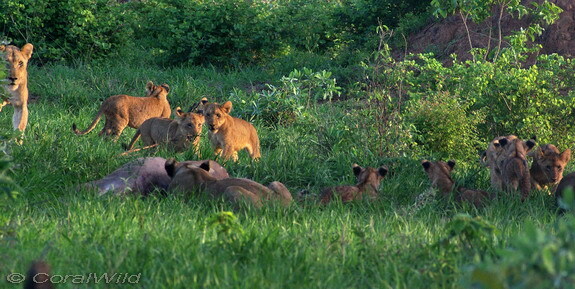 Sue, not only are you a great safari guide and photographer but story teller as well!!! I agree with the rest of your fans...I can not wait for part two!!!! !